The most detailed portraits ever of the Earth's land surface have been created with ESA's Envisat environmental satellite. The portraits are the first products produced as part of the ESA-initiated GlobCover project and are available online. Bimonthly global composites for May to June 2005 and March to April 2006 can be accessed through a newly developed map server tool on ESAâ€™s GlobCover website. On 19 June, additional bimonthly global composites will be made available as well as the first part of a global land cover map over Eurasia. Around 40 terabytes of imagery â€“ an amount of data equivalent to the content of 40 million books â€“ were acquired between December 2004 and June 2006 and processed to generate the global composites. The composites will support the international community in modelling climate change extent and impacts, studying ecosystems and plotting worldwide land-use trends. The United Nations Environment Programmeâ€™s (UNEP) Ron Witt said: "The GlobCover data sets should allow UNEP to do frequent monitoring of environmentally-critical sites and known 'hot spots' in areas we have under examination around the globe, and to update our knowledge of such changing environmental conditions, in order to alert the global community to emerging problems before it is too late for decision-makers and civil society to take action in this regard." Jean-Louis Weber highlighted the importance of the GlobCover products in the framework of the European Environmental Agency (EEA): "From the point of view of time scales, the contribution expected from GlobCover is of paramount importance. Combined with the Corine data on which the current accounts of land cover change at the European scale are based, a regularly updated GlobCover is expected to play a key role in the implementation of nowcasting procedures, necessary for delivering up-to-date data on land cover change at the European scale at a pace compatible with the main socio-economic indicators." The Food and Agriculture Organization of the United Nations (FAO) will use GlobCover products to support many of its activities. "GlobCover products should constitute an important interpretation asset in support of more dynamic environmental parametres such as rainfall and vegetation condition for FAO's global and national food security early warning programmes on which ESA and FAO cooperate closely," FAOâ€™s Dr. John Latham explained. "It will also significantly contribute to the monitoring and assessment of global land cover and as such will support the contribution of FAO to the assessment of land degradation and the monitoring of global forest cover." The products are based on Envisat's Medium Resolution Imaging Spectrometer (MERIS) instrument working in Full Resolution Mode to acquire images in polar orbit at an altitude of 800 km with a spatial resolution of 300 metres. The global composites are produced by processing MERIS images together in a standardised way. Thirteen out of 15 MERIS spectral bands are processed with an upgraded algorithm including tools for ortho-rectification, cloud screening and full atmospheric correction, which accounts also for aerosol. The global land cover map, which is ten times sharper than any previous global satellite map, is derived by an automatic and regionally adjusted classification of the MERIS global composites. The 22 land cover classes are defined according to the UN Land Cover Classification System (LCCS). 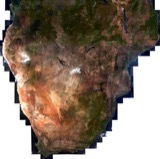 GlobCover is taking place as part of ESAâ€™s Earth Observation Data User Element (DUE). 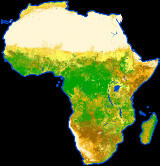 An international network of partners is working with ESA on the project, including the United Nations Environment Programme (UNEP), the Food and Agriculture Organisation (FAO), the European Commission's Joint Research Centre (JRC), the European Environmental Agency (EEA), the International Geosphere-Biosphere Programme (IGBP) and the Global Observations of Forest Cover and Global Observations of Land Dynamics (GOFC-GOLD) Implementation Team Project Office. "GlobCover is an excellent example of a successful inter-agency partnership, and we are especially pleased that the LCCS â€“ a joint FAO/UNEP standard â€“ is being used as the basis of the classification," Latham said. The GlobCover processing chain has been developed by MEDIAS France, which is also operating the processing chain, together with Brockmann Consult, the UniversitÃ© catholique de Louvain and partners. The first GlobCover user consultation meeting will be held at JRC in Ispra, Italy, on 20 June 2007 where users will discuss the quality of the first products and how they will integrate them into their work. Users are encouraged to provide feedback on data access and product quality by email to due@esa.int by 1 June. Those interested in attending the user consultation meeting may apply by emailing the same address.